A Rain of Frogs > Now this is thinking! There are many ways of displaying information, as the info aesthetics blog shows, some are just lovely. 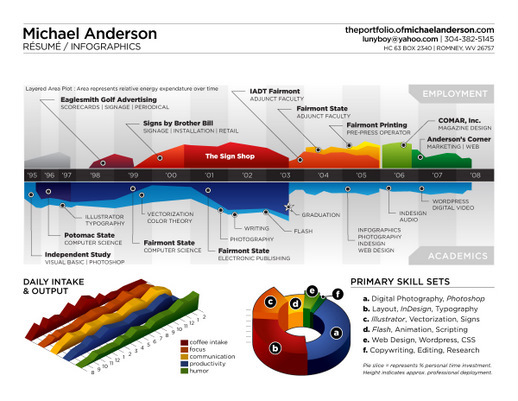 Well, in that spirit, I decided to update my résumé with a different perspective on the typical time-line theme. This is just concept art, as there are almost no real metrics represented except for time. This résumé just floored me. Sure it needs to be thought out a touch more, but this is what they mean when people talk about ‘thinking outside the box’. It would certainly catch my attention, and if I were hiring designers instead of developers, I would have already been impressed.